Purse features a removable Tribble key fob with delta charm! Bag measures 12-inches long x 9-inches tall x 5-inches wide. Graphics include a Star Trek logo, phasers, Spock, Bones, and more! 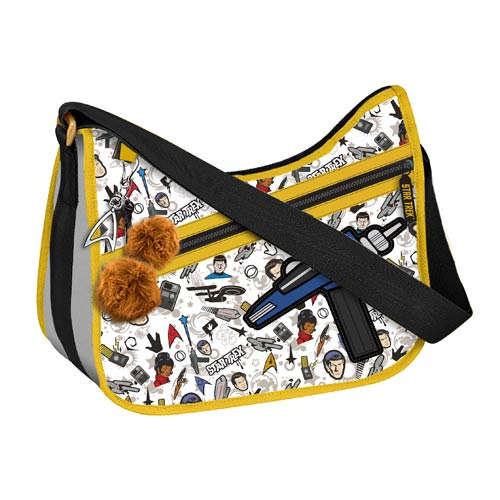 The Tribble key fob makes this Star Trek Original Series Pattern Purse an instant classic! The bag features phaser, Star Trek logo, delta, Spock, Uhura, Bones, and communicator graphics. Made from a nylon fabric, it boasts an angled front zip pocket with a custom Star Trek zipper pull, an adjustable wide nylon webbing strap, a detachable Tribble key fob with custom delta charm, and inner pockets for storage. The Star Trek Original Series Pattern Purse measures 12-inches long x 9-inches tall x 5-inches wide, with an approximately 49-inches long strap. Ages 14 and up.